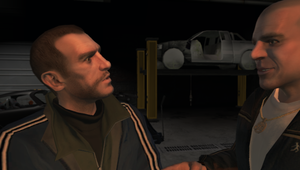 Niko Bellic talking to Brucie Kibbutz at Brucie's garage. Search and Delete is the first mission for Brucie Kibbutz in Grand Theft Auto IV. Lyle Rivas has been ignoring and aggravating Brucie, now Brucie wants Niko to take him out. Towards the end of the cutscene, Brucie tells Niko that he needs to hack an LCPD police car to find Lyle Rivas and dispose of him. After the mission, Brucie will text Niko to tell him about the Vigilante mission that can be triggered from the same LCPD computer screen as earlier. The police record of Lyle Rivas. Lyle Rivas about to jump out his bathroom window to escape from Niko Bellic. This page was last modified on 24 September 2014, at 04:36.